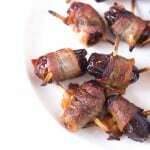 Bacon Wrapped Dates – an easy 2 ingredient appetizer or snack. The perfect combination of salty and sweet. Paleo, gluten free, Whole30. You are looking at my Valentine’s Day present. Shawn and I aren’t really in to gifts. Instead, we gift each other date nights out, or day trips around California, or vacations. To us, memories are much more important than things. This year, we decided to skip gifts and instead spend Valentine’s Day/President’s Day weekend away in Murphy’s, CA which is the cutest little wine town in gold country. But Thursday after work, I came home to a sparkling clean house, with a glass of wine waiting for me and this plate of bacon wrapped dates. As we enjoyed a little after work drink and appetizer, he told me that he had filmed AND photographed this recipe for me so I could put it on the blog, and not have to worry about shooting a blog recipe this weekend and just enjoy our time away. Best Valentine’s Day present I could ever get. If you have never made bacon wrapped dates, you need to change that immediately. 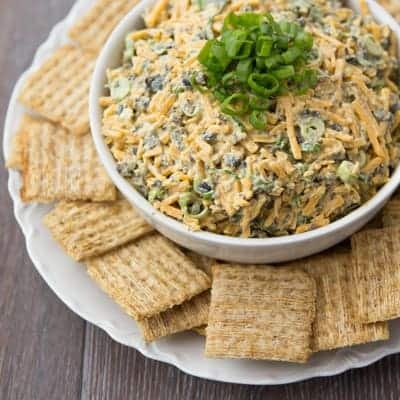 It is such a quick and tasty 2 ingredient appetizer that everyone loves. It’s salty mixed with sweet, crispy mixed with creamy. 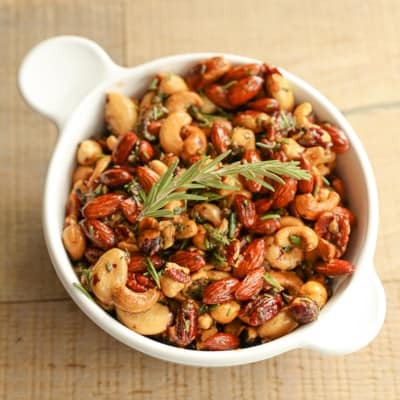 A delicious combination that is paleo, gluten free and Whole30 approved. I like to microwave the bacon for 1 minute, just to get the cooking time sped up. That 1 minute of cooking also leaves you with much crispier bacon in the end. These bacon wrapped dates taste best served within an hour of cooking them. My favorite is when they’re still warm from the oven, just about 10 minutes after baking. I wouldn’t recommend making these far in advance, they don’t keep very well. Follow Shawn’s lead and surprise your sweety with an afterwork bacon wrapped date date, which is the best kind of date of all. Lay the bacon on a microwave safe plate and microwave for 1 minute. Cut the slices of bacon into 3 pieces. Wrap a piece of the bacon around the date and secure with a toothpick. Lay the bacon wrapped dates on the parchment paper and bake for 10-15 minutes, or until the bacon is golden brown. Cool for 10 minutes before serving. Wow, I’ve never tried bacon-wrapped dates before, but these look unbelievable D.E.L.I.C.I.O.U.S!!! Oh wow, these look AMAZING, Natalie! I had bacon wrapped dates a few years ago at a party, and I’ve been dreaming about them ever since. My friend even gave me the recipe, but I just haven’t gotten around to making them. These sound incredible! And I love how easy they are to whip up, too! Pinned! Love that sweet and salty combo! I could eat an embarrassing amount of these in one sitting, lol! That’s so sweet of Shawn to film those for you. Y’all are just the cutest! A husband willing and able to compile a blog post for you?! Hot damn, I’m jealous! ;) I think my guy would look at me like I’d grown an additional head if I suggested such a thing, haha. That Shawn! These dates look absolutely delicious . . . my mouth is watering! That is the SWEETEST story! I love that he did that for you. Plus, I’m sure these bacon wrapped dates weren’t too difficult to eat :) I haven’t tried bacon wrapped dates yet but I’m dying too. The sweet and salty combo must be amazing! He is too good to me! 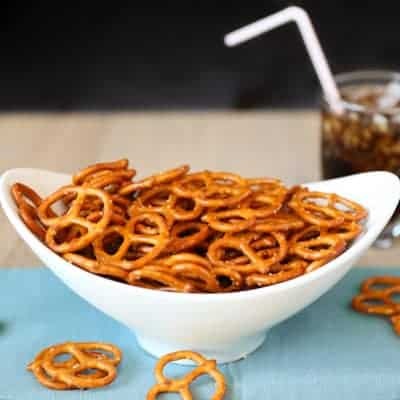 You must try these Bri, salty and sweet combo is the best! OMG these look sooo good! And they’re so simple. I need to try these for sure – pinned! Oh my gawwwd how sweet is that!! If I’m semi-stressing about a recipe I’m going to blog my boyfriend will chop up the vegetables and basically be my sous chef. He used to work in a restaurant so his knife skills are way better than mine!! Hope you guys had a wonderful weekend, and I *need* to try these dates soon. Simple and I bet they’re outrageous! SO sweet — he’s a keeper! These look totally amazing! We don’t really do gifts either. I totally agree that memories are much more important! I have had bacon wrapped dates once before but have never made them myself. I love how crispy and awesome that bacon looks!!! It’s kind of nice never having to stress about buying presents. I’ll just book us a fun dinner reservation instead. Win win! These bacon wrapped dates sound amazing! Now if I could just get your husband to teach mine how to make and photograph recipes, that’d be great! How sweet, Natalie! It’s so nice that he’s good with a camera. Makes blogging super easy sometimes. He taught me everything about shooting in manual. I was clueless! 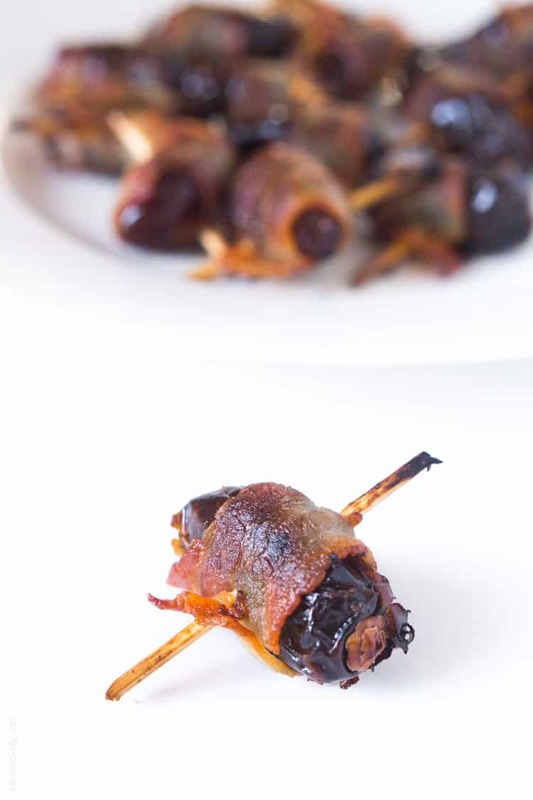 I love little savoury nibbles like these bacon wrapped dates! They look so super simple to make – and I bet taste incredibly delicious too. That is so thoughtful of Shawn! He’s definitely a keeper. Glad you were able to enjoy the weekend stress free. 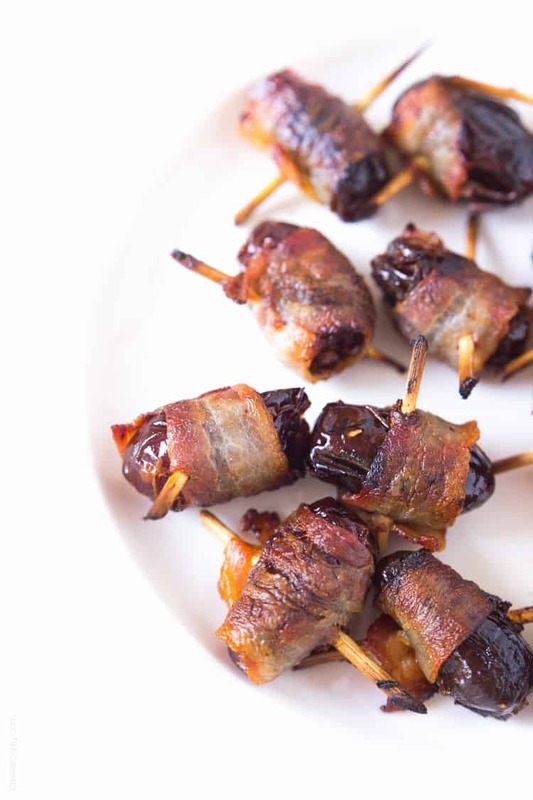 Bacon wrapped dates are one of my favorite appetizers! What a sweet gift for Valentine’s Day! A weekend away without worry about the blog is the best gift ever. Wow, what a sweet husband you have! These look just perfect. I don’t eat a lot of dates, but I need to give these a try! Shawn sure is a nice guy! You must give these a try Kelly, so good! That is seriously the sweetest Valentine’s Day gift ever. Like ever!! I love bacon wrapped dates – these look so delicious!! Yum! Sounds like you have a great husband! Wow that is so sweet! He did a great job they look absolutely amazing! These photos are gorgeous! Love that your husband filmed this. I am SO impressed!!! And they look super yummy. Win-Win. I am loving these simple bacon wrapped dates! Pinned! And what an awesome hubby you have! Such a sweet guy to photograph and film it for you! I have to admit my hubby helps me a lot with photography too! Oh my gosh, YUMMMM! These are seriously one of my favorite apps ever! I have also had them with almonds inside and also with blue cheese inside. But ANY of the combinations is bomb. Sweet + salty = love. These were delicious and a big hit at our holiday party. I doubled the recipe & stuffed half with blue cheese. I’ll definitely be making these again in the future.